The Secret of How to Live to 110 is revealed by Bernando LaPallo, 110 years of age from Mesa, Arizona. LaPallo’s fountain of youth secrets of longevity and vitality include eating and drinking properly plus walking a mile and a half in the morning. The clean-living lifestyle also includes avoiding prescription medication, living stress-free and getting proper rest daily. Bernando LaPallo miracle diet consists of organic vegetables [greens] and organic fruits [berries] for juicing. And Super-foods like organic garlic [nature’s antibiotic] and onion, organic honey [nature’s energy booster], virgin olive oil, organic cinnamon [antibacterial], organic dark chocolate [stress reduction] and he adds some barley soup for luck. Happy to be of service. Good Day. Sexual harassment or not, talk about an awkward moment for a female sports reporter. Sarah Kustok later joked with a colleague that the two would be skipping dating and going right to marriage. The Pittsburgh Penguins Triumphed in a Game 7 , Do or Die event in the Defending Stanley Cup Champion Detroit RedWings house. The Tables were Turned from last year when Detroit Celebrated in Pittsburghs house. Good Finals for Fleury , Malkin , Staal , Talbot and company. Team Captain Crosby was the youngest capo to hoist the Trophy over his head. Excellent , hard-fought Victory. Imagine how great the world would be if Banksters and Politicians played their respective “Games” with this much Passion & INTEGRITY. Good will for all. Congratulations. You Deserve all the Good Fortune. 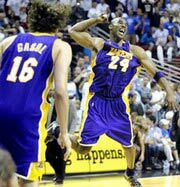 Kobe Bryant and the LA Lakers TEAM are Back in a Big Way – Winning the 2009 NBA Championship in a Convincing Fashion , four games to one over Orlando. The Final score of 99-86 in Game 5 gave the Lakers their 15th Championship , guru coach Phil Jackson his 10th and Finals MVP Kobe Bryant his Fourth Ring. Yes , KOBE , “It’s Over” You silenced the critics and the LA fans who only love a winner. You Won a Championship without Superman , Shaq. Basketball is a team sport but it was definitely Finals MVP Kobe Bryant’s night. 30 points – 6 rebounds – 5 assists. The Los Angeles Lakers , once again , back on Top.